I was going to blog about a totally different subject today but then this email landed in my inbox. I think it misses a trick and will fail to convert new prospects which surely is the point. So let’s take a look at where it could be improved. Perhaps I’m being pedantic so when one of the features says, ‘Satisfactory Guarantee’ my reaction is ‘who says so?’! I think they mean ‘Satisfaction Guaranteed’ but if that is the case do I believe their statement that they have a quality control procedure? I’m beginning to have doubts. 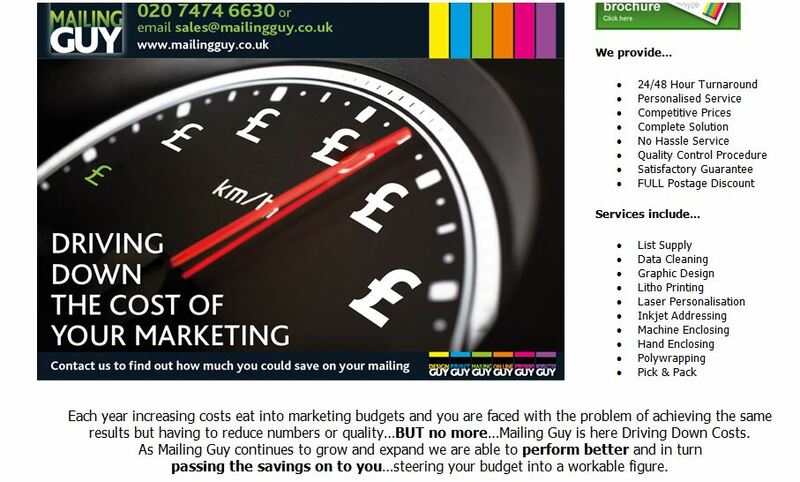 Each year increasing costs eat into marketing budgets and you are faced with the problem of achieving the same results but having to reduce numbers or quality…BUT no more…Mailing Guy is here Driving Down Costs. As Mailing Guy continues to grow and expand we are able to perform better and in turn passing the savings on to you…steering your budget into a workable figure. Mailing Guy – Driving Costs Down so you don’t have too. This is fine as far as it goes, it speaks to us in everyday language and on a topic we can all identify with. It highlights the problem we are facing which is an important consideration when compiling a marketing message. However I think it stops too soon. It misses the proof that will make us want to take action. Why not include a couple of examples of reduced prices or case studies where they have saved their clients money? We’d be more inclined to take action if we could see how we might save. There are three calls to action within the mailing which is a good thing. However I think they can be improved. The first is at the top of the page where we are invited to ‘call their experienced team’, that’s fine. It makes it easy to find their contact details and implies that they should be able to help. The second comes under the headline and says, ‘Contact us to find out how much you could save on your mailing’ this is OK but could use a bit of urgency with insertion of the word ‘now’ but make it easy for me and give me the phone number again. On my computer screen I have to scroll up to find it. I’m lazy, make it easy for me to respond before I forget. The third comes at the end of the copy, exactly where it should be. It reads, ‘Contact us NOW and see how you and your company will benefit from our service.’ So this one has got the urgency but why not ram home the point and, rather than, ‘see how you and your company will benefit from our service’ why not ‘Contact us NOW and see how much we can save you’? Again include the phone number and/or email address. So what do you think, would this mailing make you take action and if so what? I visited the website where the home page tells me that they are experts in mailing but says nothing about cost savings. I know there are some things they do very well and this mailing is better than many I receive but I still think it can be improved. Do you agree? I know from personal experience that it’s much easier to write copy for a client than it is for our own businesses. We get too close to our work to see where it can be improved. We don’t have anyone to challenge what we have written. So if you could do with an outside perspective on your marketing materials email blog@thetrainingpack.co.uk. I’ll review one email, letter or small brochure at no charge. Feedback will be confidential so don’t worry about being pulled apart here (unless you want to be!). This entry was posted in Marketing, Small business advice and tagged Advertising and Marketing, Email address, Email marketing, Mail, Mail List, Marketing, Target audience, Telephone number by glendashawley. Bookmark the permalink.